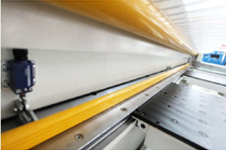 pressure beam automatically self-adjusted according to the total height of panels, to shorten the travel range, hence higher efficiency. Saw carriage automatically moved to fit based on the width of panel, reduces travel distance. Quick exchange of main saw blade, ideal design for operator. Both main saw and scoring saw with independent movements of up and down, also main saw automatically self-adjusted minimizing the lifting height for efficiency besides making best finish, scoring saw movements of up and down, as well asfront and back, adjustable by software offering intelligent, fast, and easy elements. Device fixed within saw carriage to push from side of board when running to cut, even for thin and soft board, at the same time to guide alignment for perfect square cut. 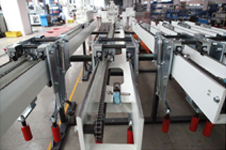 Additonal function for re-work of any particular piece (scanner optional), a good helper for customized furniture production, completely solved problem raise from possible setting mistakes and occasional errors caused by operator. 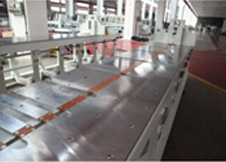 The steel frame welded with heavy steel plates is made by tip-top metal processing center. After heat treated and constructed, the steel frame is solid and stable that permits high capacity cutting. Floating feed table with steel balls prevents any scratches on panel surface and ensures panel transmitted smoothly. Paired with a 1.5kw air pressure fan. Independent working table in front and back reduces processing difficulty. Saw carriage adopted standardized assembly. Tested continuously for a long time. 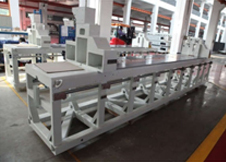 Guided with round guide rail on top and bottom, 22mm thickness thick solid plate bearing type unilateral suspension structure designed for stable movement of saw carriage. 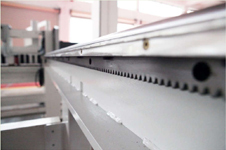 The saw carriage is driven by servo motor through rack and pinion to ensure the cutting precision. Main saw and grooving saw activated by belt drive. 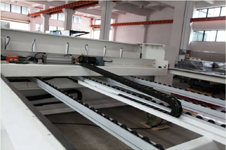 Main grooving saw with double saw blades in both directions to reduce the incidence of crack in laminated board while cutting so as not to deburr the edges again. 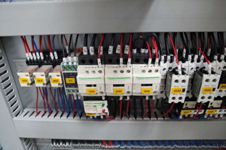 When performing cross cut, put same pressure on the whole panel surface. Piano type dust cover provides a completely enclosed blade guard and prevents flying dust and chips. 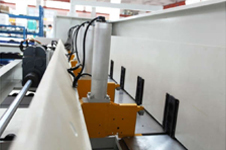 make pressure beam height suitable for panel thickness, reduce power. 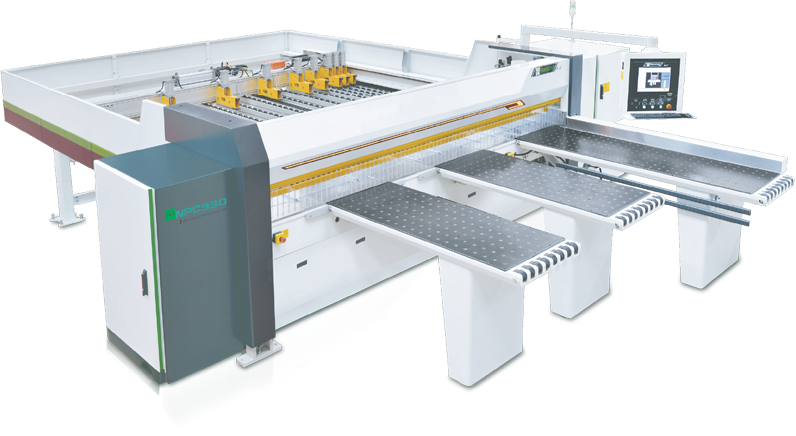 Used to compress panel tightly while cutting, coordinate well with grippers for high cutting accuracy. 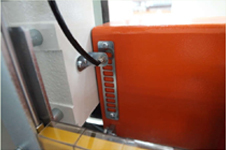 Transmitted by chain, and contact roller cover by rubber prevents panel from moving. Pinion and rack in both sides for balance of guiding. Central location of servo motor for allocating average power on each side of actuating device, to guarantee the high precision and stability. 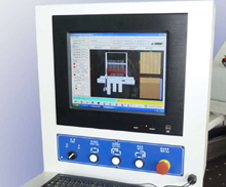 Pinion and rack feeding structure improves the precision. User-friendly HMI coordinated with USB interface, network card, mouse and keyboard for easy operation; Chinese and English are available. Controlled by IPC, Windows operating system and Nangxing’s professional computer saw cutting software. Label printing function is available (Pattern is optional). 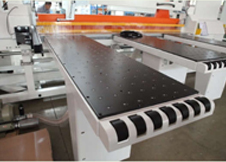 Connected perfectly with Nanxing’s computer panel saw for best layout of material list. Processed with function of rest material management so that the rest material can be utilized first. Optimizing percentage of out turn. 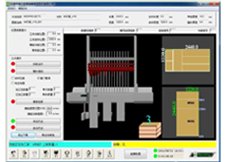 Panel texture and panel store are optional according to the material list. 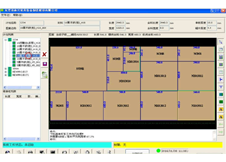 The layout, direction and the number of the whole panel can be indicated graphically in the screen while cutting. Position of rest material is optional. The use of panel guide and how to cut can be determined. A protective device mounted on pressure beam for protecting operators. 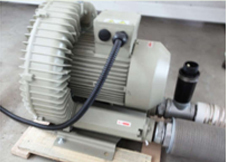 The automatic lubrication system ensures smooth operation, easy to maintenance, and reduces the possible costs of repair. The alarm displays error code and description informs operator with the course of error rapidly to improve work efficiency.